“The Rural Payments Agency (RPA) is today publishing a plan setting out how the Agency will be transformed over the next five years so that it delivers both vastly improved service to its customers and much better value for money for taxpayers. I have arranged for copies to be placed in the Libraries of the House. “This is an important turning point for the Agency. The 2013 review of RPA which I published in July 2010 provided an independent, evidenced based view of RPA’s then current state as well as its readiness for implementation of the expected reform of the Common Agricultural Policy (‘CAP 2013’). The conclusions offered a stark assessment of the Agency’s capabilities in terms of basic finance functions, customer service, IT, leadership and governance. The negative effects on RPA customers and for taxpayers were as clear as they were unacceptable. I said then that I would not allow that state of affairs to continue and that I would personally drive forward progress by chairing a new Oversight Board. “Under a new Chief Executive and senior management team improvements are already being seen at RPA. For example, my written statement of 11 January 2012 (col.16 WS) reported that in December 2011 the Agency had made its highest ever proportion of SPS payments in the opening month of the payment window. However, as is made clear in the plan, further work is required in a number of areas (data, controls, IT, organisational structure, systems and people) in order to fully overcome the legacy of the failed implementation of the SPS in 2005. Meanwhile, the challenge of implementing the CAP 2013 reforms, currently under negotiation in Brussels, looms ever closer on the horizon. Improved people capacity and capability. “Many of these projects deal with improving underlying processes and data to make RPA’s foundation more solid and the outputs may not be very visible to its customers during the life of the SIP itself. However, these projects will be crucially important in ensuring that the Agency is on a sound footing to deal with the amount of change it faces over the next five years. “Phase 2, the Future Options Programme (FOP) will take centre stage from 2014-17. The FOP is looking presently at alternative models for delivering some or all of RPA’s business following the CAP scheme changes post-2013. Once the right operating model for the future is established the FOP will assess delivery options, which may include various forms of outsourcing, and then set in train the procurement process; all this activity will take place within the next two years. The objective of the FOP is build on the work of the SIP to provide a much better service to RPA’s customers and much better value for money for the taxpayer. “Annual RPA business plans will set out in more detail the expected costs and outputs in the year ahead. 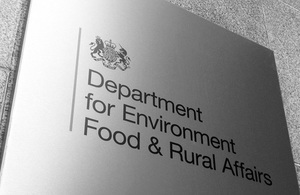 The business plan for 2012/13 is scheduled to be published in April However, I can confirm now that Defra is investing an addition £21.8 million in the next financial year, with a further £19.1 million provisionally earmarked for the following two financial years. This represents a serious commitment to finally drawing a line under RPA’s unfortunate legacy and putting it in the best possible position to implement the CAP 2013 reforms.